St. Paul’s Catholic School was established in 1984 with 45 pupils from Prep to Grade Three beginning their first day on February 20th . Most of these children were drawn from the Bridgewater and Gagebrook areas. The school was established under the leadership of the Sisters of Mercy and the Christian Brothers who provided principals until 2001. Since 2002 the lay principals and staff have continued to honour the spirit of these founding Orders. The school motto, “We are God’s Work of Art” (Ephesians 2 :10) was chosen to encourage us all to believe in the goodness of God and the hope God holds for each of us and that we are constantly growing in God’s love. The initial building program was of three classrooms, canteen and staff and amenities facilities. Two further classrooms were added for the school year of 1985, and again two more and the library were ready for the 1987 school year. The hall and a new staffroom were completed in 1988 when the school was then officially blessed and opened. A new library was built in 2003 to cater for the growing needs of the school and the Administration offices were moved to the front of the school. In 2004 a kindergarten was established in a portable classroom towards the back of the school. Classes remained here until 2010 when the library was converted into a very welcoming Kindergarten facility at the entrance to the school. Using Building the Education Revolution schools funding during 2010, the new Prep classroom was erected, a new library was built, the hall was extended and all classrooms were renovated with the operable walls being added to the rooms and some corridor space being incorporated within the classrooms. 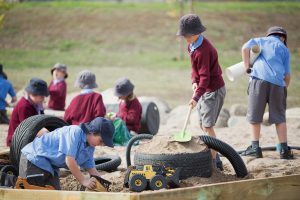 Over the years the ovals and playground facilities have continually been upgraded to cater for the needs of the children and to enhance the appearance and appeal of the school within the locality. During the 2014 school year the big project is to develop the Play Box area below the main oval. Our children are now drawn from a wider area, coming from as far away as Pelham, Kempton and Bagdad as well as the closer areas of Brighton, Honeywood, Old Beach and Pontville.